21-Jan-2012 -- This was my first Confluence visit and what a fantastic place it was. I had just spent the first three weeks of January, 2012 with two old friends; backpacking back and forth across the Chilean and Argentinian Andes and after one of those friends had to return to the United States, the remaining two of us left from Santiago, Chile on January 19 with the intention of visiting this Confluence. It involved a lot more effort than I had imagined last summer when I was making plans for the visit and scouting the area on GoogleEarth. We rode north by bus from Santiago for 12 hours to the city of Copiapó where we spent the night. The next day we rented a 4x4 pickup truck and drove north from Copiapó to the small town of Diego de Almagro and then east from there on a good dirt road that went up a deep river valley and then up out of it onto the Altiplano and on to the south side of the Salar Pedernales. The Salar is a huge salt flat at an elevation of 11,000 feet (3350 meters). To get as close to the Confluence as I was willing to drive required that we go all the way around the west and north sides of the Salar. This made for a long drive as the road there followed along the edge of the shoreline of the salt flat and we had to trace the outline of all of its many bays and peninsulas. We camped that night on a bluff above the northeastern-most corner of the Salar after driving for seven hours. That night was cold but the sky was clear and we saw more stars than would seem possible. January 21 was the day that we visited the Confluence. We started by walking north from our camp up a broad valley and after an hour or so we turned to the Northeast and climbed up a side valley that led to a pass at an elevation of about 13,000 feet (4000 meters). From there the route we took to the Confluence was the path of least resistance. We walked around the hills and across the valleys and basins. The weather was cold and windy in the morning, but became warmer – but still windy – as the day progressed. The terrain we crossed was like no other that I have ever walked through and it is hard for me to describe it. Although there were valleys that looked like drainages, they weren't watercourses. I could not see any evidence of water ever having flowed anywhere on the surface. The hills were all softly rounded and the ground was a soft mix of dirt and small rock chips. The only vegetation that we saw were widely scattered tufts of dry grass and small shrubs. It reminded me of some of the scenes I've seen in photos taken by spacecraft sent to Mars. The place was only marred by the occasional vehicle tracks that we came across. I suppose that there is nothing to stop someone from driving anywhere they want to up on the Altiplano if their vehicle is capable of it, but that certainly leaves an ugly and indelible scar on what would otherwise be a pristine landscape and I wish that people wouldn't do that. On our way to the Confluence we were lucky enough to see singly and in groups a total of fourteen Guanacos. Usually they would run away as soon as they saw us, but sometimes they would stand in place and scold us with their distinctive call. We finally arrived at the Confluence in the early-afternoon and found it to be near the bottom of a north-facing slope of the side of a small valley that opened to the West. The surface of the ground was small broken rocks like everywhere else in the area and there was very sparse vegetation. As soon as I had documented the site, we began to return to our camp on the edge of the Salar. The walk we made out to the Confluence and back to camp was over 15 miles (24 kilometers) long and it took us 10 hours. When we arrived back at our camp late in the day we were both very tired. The night sky was again a fog of stars. The next day we drove back around the north side of the Salar the same way that we came in and then drove up a rough 4-wheel drive road that went around and up the west side of the nearby Volcan Doña Inez – a 16,600 foot (5060 meters) extinct volcano. The road ended at 14,500 feet (4400 meters) at an old abandoned mining prospect and we camped there. In the morning after a very cold night, we climbed to the top of the volcano. There we found a stone platform that was likely built by the Incas and a view of the Altiplano that I didn't want to leave. 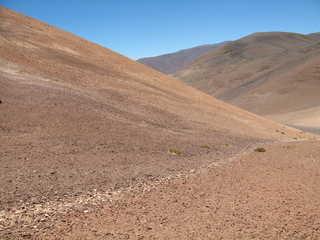 #8: View of Altiplano between the Confluence and camp. #9: View of Altiplano between the Confluence and camp. #10: Sharky walking on Guanaco trail back to camp. View of Salar Pedernales.